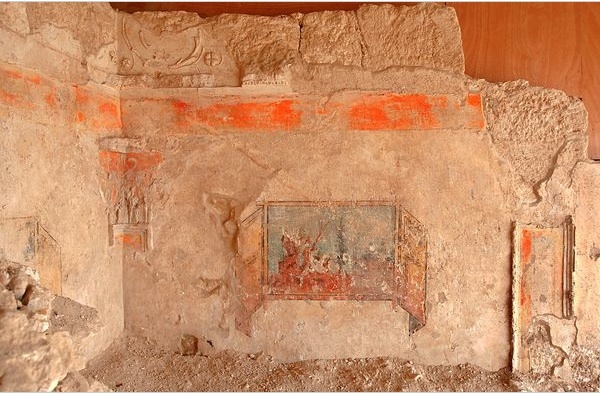 First discovered in 2008, the Royal loggia (theater box) above the regular rows of seats at Herod’s private theater has now been fully excavated. On your next visit to Israel make sure that Herodium is on your itinerary. I can take you there and give you a comprehensive and fascinating guided tour. “There is nothing like this in any other location” in Israel, Netzer said of the paintings and intricate moldings in Herod’s theater box. But the style was fairly common across the Mediterranean and reflects the Roman origins of Herod’s power. “Our art history expert said, ‘Hang on, this is something very familiar from Italy,'” in terms of both style and method, Netzer said. “The technique used here was not particularly accepted in this region; it was secco rather than fresco“—painted on dry, rather than moist, plaster. 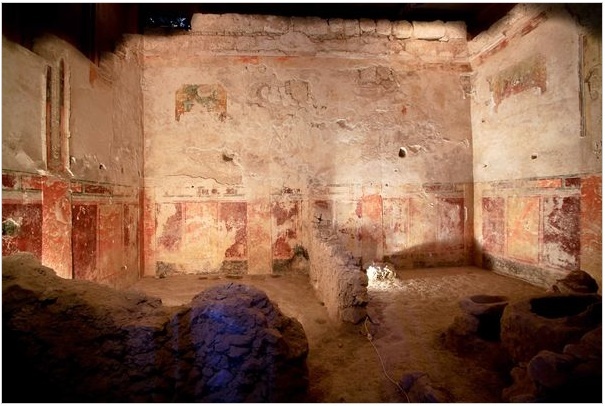 Depicting natural landscapes, nautical scenes, animals, and the Nile River, the paintings most closely resemble others in the roughly contemporary Villa Imperiale at Pompeii. According to Netzer, the pictures are not only Roman style but Roman made, perhaps executed in advance of the visit of Marcus Agrippa to Judea in 15BCE. Agrippa was Augustus’ deputy and the man responsible for many of the building projects in his empire. “It was a one-time mission. The artists came, they painted, and they returned to Italy.” says Netzer. There are other examples from the same period where Roman techniques and presumably builders and architects were sent to Judea for a specified period of time to assist in building projects. Archaeological excavation have uncovered walls at three sites built using the Roman opus reticulatum and opus quadratum techniques. These sites are Herod’s winter palace at Jericho, a temple at Banias and a round structure north of Damascus Gate in Jerusalem, apparently the mausoleum to members of Herod’s family, all mentioned in Josephus’ writings. This entry was posted in Archaeology, Architecture, Art and tagged architecture, culture, Herod, King Herod, Marcus Agrippa, Roman culture, Roman theater on October 17, 2010 by Shmuel Browns.